Time management for your branding and marketing to-do lists. 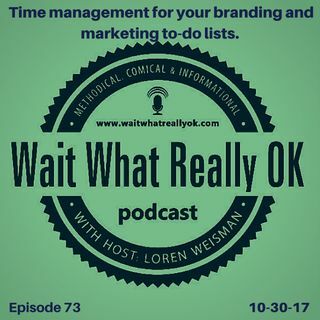 Wait What Really OK Podcast Episode 73 hosted by Branding Strategist and Keynote Speaker Loren Weisman talks organization and making little amounts of time for the big projects over time. Between the mixture of those that make out that working a certain number of hours means they are being effective to those that feel they need hours straight to work on a project instead of working on it in small segments and bits of time, time ... Más informaciones management for your branding and even your sanity can be a challenge. In this episode, I am not presenting an all-around answer but bringing to the table a few concepts and thoughts to apply in order to be that much more effective with the time you have and the work you have to do. Your strategy in time management for your branding, for your workload and for your profit is key. Bringing some patience to the table and realizing that it will never be the perfect time to be able to work on a given project for as long as you want, the whole, spread it out and work on it some each day instead of pushing it out can be a great move. Ep 73 “Time management for your branding and marketing to-do lists.” of the Wait What Really OK Podcast is available on iHeartRadio. Podcast Blog Supplement for Episode 73 of the Wait What Really OK Podcast with Loren Weisman. Podcast Link Supplement for Episode 73 of the Wait What Really OK Podcast with Loren Weisman. Only getting the A and Z without the B through Y, leaves you SOL. Podcast Video Supplement for Episode 73 of the Wait What Really OK Podcast with Loren Weisman. Podcast Photo Supplement for Episode 73 of the Wait What Really OK Podcast with Loren Weisman.